Howlin' Wolf Records: SIX STRINGS: RagN'Bone's WHITE ZOMBIE trailer! The cool guys at RagN'Bone Productions asked if I would pass on the word that the trailer for their next film WHITE ZOMBIE is up and ready to be viewed on THE YOUTUBE. Below is the links to their website and their Youtube page which features the new trailer. They are taking the gutsy approach and remaking the classic film WHITE ZOMBIE that starred Bela Lugosi. The trailer shows their ambitious and extremely unique take on the material. I gotta say that the last image in the trailer left a gruesome image in my brain in a good way. I am beyond intrigued. This should be a good one. 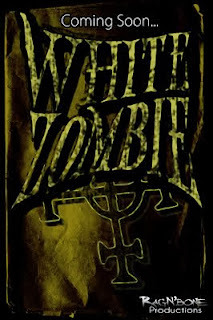 CLICK HERE FOR NEW WHITE ZOMBIE TRAILER!!! CLICK HERE TO CHECK OUT THEIR WEBSITE!! !